Indonesia's 17,000 islands are greatly outnumbered by its species of native flora, many of which are threatened. The massive Titan Arum preparing to bloom. Indonesia is comprised by over 17,000 islands, and is located in a transitional zone between some of the world’s largest flora and fauna habitat regions. The islands are home to endemic plant species which include over 40,000 species of flowering plants, 5,000 orchids species and the monster flower (Rafflesia arnoldii), which is the biggest flower in the world. All these species combined, make up 11% of the world’s plant species. The native plants of Indonesia are concentrated in the tropical rainforests and include trees, shrubs, herbaceous plants, vines, climbing plants and epiphytic plants. These are some of the native species. 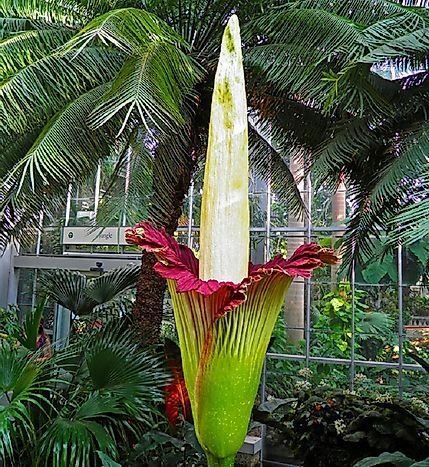 The Titan arum (Amorphophallus titanium) is a flowering plant that is endemic to Sumatra in the Indonesian Archipelago. It is a truly spectacular plant that is known for its very large flower which can rise up to 3 meters from the ground. It has the largest non-branched inflorescence in the world with a giant floral structure that has been recorded to reach 3.5 meters. It’s flowering is rare, but when it does, it becomes a center of attraction. The Titan plant grows in the rainforest and can be used for ornamental purposes. However, it has a nauseating smell during the flowering period. The main threat facing the titan arum is the extensive deforestation of the Sumatra rainforest which is the main habitat, in order to make way for oil palm plantations and to obtain timber through logging. The Rainbow Gum Eucalyptus Tree (Eucalyptus deglupta) is one of the most beautiful trees one could ever find, having a bark with various colors. It is native to several places including New Guinea, Seram, Mindanao and Sulawesi. It is the only Eucalyptus species that can thrive in the northern hemisphere. In tropical regions such as Indonesia, it thrives in the rainforests. During various seasons, the tree’s bark peels to reveal fresh green bark which then becomes orange, purple and blue with vertical streaks of red and orange. This tree can grow up to 60 meters tall and 2 meters wide. It is mainly used in tree plantations to give pulpwood for the manufacture of white paper. The Melati plant is common across Southeast Asia where it is widely cultivated. It is a small shrub or vine that grows up to between 0.5 and 3 meters tall. It is popular for its attractive and sweetly fragrant flowers. The flowers of the melati (Jasminum sambac) are used to make teas and perfumes. In Indonesia, it is known as melati putih and is used as one of the national flowers of the country. The Anggrek Bulan (Phalaenopsis amabilis) is one of the three national flowers of Indonesia. Its common name translated means ‘the moon orchid’. It is said to represent the charm of the Indonesian people. It is also used as a symbol plant in China where it represents friendship, elegance, perfection and all things feminine. Phalaenopsis amabilis is cultivated as an ornamental plant and has been used to produce hybrids and cultivars. Its conservation status has not yet been established though one of its subspecies (P. amabilis subsp. rosenstromii ) is classified as endangered. Other notable native species of Indonesian flora include the Padma Raksasa Rafflesia, the Malay Paduak, the Javanese Edelweiss, the Nipa Palm, the Common Swamp Pitcher Plant, and the Teak Tree.